The Eclipse E600POL, based on Nikon's popular Eclipse E600 microscope, features a 12 volt-100 watt internal tungsten halogen illumination system that tunnels through the base to provide bright and stable diascopic Köhler illumination. General construction parameters for the microscope center around a universal (modular) frame designed to accept attachments for advanced analytical and quantitative polarized light microscopy applications. 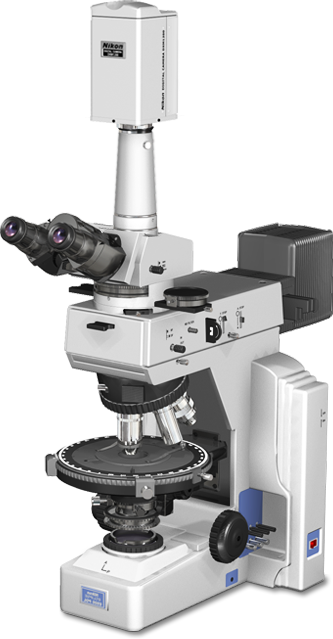 The basic microscope is compact in size and is equipped with ergonomically placed controls that help to eliminate stress and strain found with other less "user-friendly" microscopes. Nikon engineers have lowered the focus knobs on the frame and improved the adjustability and angle of the standard trinocular observation tubes, which allows the microscopist to assume a more natural viewing position for long periods of observation. With computer-assisted engineering, Nikon designers created a more robust base and arm that add rigidity and stability to the microscope frame. These new features meet the reduced vibration demands of photomicrography and digital imaging, especially in the low light levels commonly experienced with polarized light. The microscope is outfitted with Nikon's CFI60 infinity optical system, which provides longer working distances at high numerical apertures throughout the entire magnification range. Coupled to a 200-millimeter focal-length tube lens, the microscope is capable of producing images that are crisp and clear with high contrast and a minimum of flare. CFI plan achromatic polarizing objectives are available in 4x, 10x, 20x, 40x, and 100x powers. For reflected light investigations, CF Plan EPI differential interference contrast (DIC) objectives are available in the 5x, 10x, 20x, 50x, and 100x powers. However, in order to employ these objectives on a standard E600 nosepiece, a 15-millimeter adapter is required. Equipped with a detachable, reversed centering quintuple nosepiece that can be removed for easy cleaning an maintenance, the microscope can be readily adapted for either diascopic or episcopic observation (without affecting the specimen and microscope settings) simply by interchanging nosepieces. In addition, the nosepiece is equipped with a standard DIN slot for convenient insertion and removal of special-purpose compensators. A circular graduated rotary stage with positive-action click stops and graduations placed in one-minute increments is also standard equipment. The polarizer is equipped with two-degree graduations and is fitted to the bottom of the condenser holder, while the analyzer is housed in an intermediate piece that also has a slot for insertion of compensators. Images from the intermediate tube can be projected into the trinocular head to enable digital imaging and/or photomicrography while performing orthoscopic or conoscopic microscopy. A wide selection of accessories allows users to configure the microscope to meet their specific needs. The slider-type analyzer (positioned in the intermediate tube) has a large rotation control wheel for easy adjustment and accurate reading through rotations of 360 degrees. Compensators such as the Sénarmont, one-quarter wavelength, full-wave sensitive tint plate, and quartz wedge are available as options for insertion into the intermediate tube. The Bertrand lens, also located in the intermediate tube, can be focused and centered for the best conoscopic observations, closed-circuit television (CCTV), digital imaging or traditional photomicrography. Several additional intermediate tubes have been designed to fit this model, including a drawing tube, a side-by-side or face-to-face teaching module, and a pointer module. Interchangeable diascopic and episcopic polarizing observations are made possible by mounting an episcopic vertical illuminator between the microscope frame and observation tubes. The episcopic illuminator incorporates either a 12 volt-100 watt lamphouse with a tungsten halogen lamp, or an HMX xenon/mercury arc lamphouse to deliver a higher degree of brightness and to capture images of low-reflectance opaque specimens with excellent sharpness and ample image contrast. Unlike polarizing microscopes that require an external power supply, the E600POL tungsten halogen epi-illuminator is powered by the transformer built into the microscope's body. Easily accessible control knobs enable the operator adjust the illumination filters, aperture diaphragm, field diaphragm, polarizer, and analyzer slider positions and readily switch from brightfield to darkfield applications. Other intermediate tube options for the E600POL cannot be used when the epi-illuminator module is installed. A variety of additional accessories for Nikon's Eclipse E600POL polarizing research microscope include photomicrographic and digital imaging equipment, several eyepiece combinations, and an attachable mechanical stage. The strain-free objectives, eyepieces and the observation tubes are available with anti-mold coatings, for use in the tropics and other locations with warm and humid conditions.